Whether it’s following a 17-hour trip on the Indian Pacific, a three-hour journey through New Zealand’s Middle Earth or a 134-hour voyage on a Norwegian cruise ship, slow TV is actually the perfect genre for today’s viewing habits, writes Aaron Burton. SBS’s suite of slow TV programs, “Slow Summer”, arrived at a fortuitous time in our annual media trajectory, when we were briefly relieved of the busyness plaguing our lives. On the back of last year’s successful trip on The Ghan, SBS commissioned Sydney-based Mint Pictures to produce two more journeys, The Indian Pacific: Australia’s Longest Train, and The Kimberley Cruise: Australia’s Last Great Wilderness. The programs were each three hours long on SBS. Longer versions (17 and 14 hours respectively) screened on SBS’s Viceland channel. Others airing are BBC Four’s All Aboard! The Canal Trip (a mere two hours), and North to South, a three-hour, Tolkien-inspired, multiple-vehicle journey through New Zealand’s Middle Earth. Still, slow TV is actually the perfect genre for today’s viewing habits. In its purest, Norwegian-inspired form, slow TV is characterised by minute-by-minute footage of a culturally significant journey, event or activity, edited together chronologically from numerous camera angles, resulting in an unconventionally long viewing experience. While The Ghan: The Full Journey might sound long (16 and a half hours), this pales in comparison to Norwegian public broadcaster NRK’s 134-hour live broadcast aboard the cruise ship Hurtigruten in 2011. Multiple cameras are often fixed onto the moving subject, notably the classic “phantom ride” perspective from the front of a train, but aerial shots, drones, and subtle tripod movements are also used. The editing pace is slow: most shots last at least 30 seconds, but a single perspective can linger for over an hour. Apart from a few notable exceptions, such as an isolated cow or the Queen of Norway as she sails by, the journey tends not to single out particular characters. Noticeably absent is the voice of a narrator, nor is there a host, nor even music. Instead, sound emanates from the environments we see (that’s “diegetic sound” in cinema speak). In short, slow TV is “slow” because it lacks the rollercoaster of emotional cues, narrative guides, and breathless editing pace we have come to expect from television. The long duration is the first obvious challenge slow TV has when attracting viewers. But if you consider our fondness for sport, we’re experts at that. A single day of test cricket usually runs longer than six hours. The 1.5 million of us who tuned in to the men’s Australian Open final on Sunday were disappointed Nadal and Djokovic couldn’t reignite their five hour and 53-minute battle of 2012. Apart from sport, and whatever happened to Big Brother, most of us are now binge-watching our favourite shows. According to Deloitte’s most recent media consumer surveys, around two-thirds of us are bingeing, defined as watching three or more consecutive TV episodes in one go, with almost half of us paying for a subscription video-on-demand service such as Netflix or Stan. Deloitte’s 2017 survey of more than 2000 consumers suggests we are spending around 17 hours per week watching movies or TV across our devices. Despite our appetite for prolonged screen exposure, slow TV is so unconventional that SBS has pitched it as a dare for us to watch. Embracing divided responses from last year’s foray with The Ghan, this year’s Slow Summer promo video (above) features a series of rival tweets: “Literally as exciting as watching paint dry”; “This is f-ing ART!”; “Yawn… I’m Ghan to bed” ; “#TheGhan a goddam masterpiece”. This promo captures one of the secrets to the genre’s success: online participation and interaction through social media makes it a collective viewing experience. Travelling across the Nullarbor on The Indian Pacific by yourself would be as lonely as midnight infomercials, but #SlowSummer fills the carriages with discussion, commentary, and comaraderie. While reality television and talk shows have been capitalising on social media interaction for some time, slow TV opens up an entirely new approach to producing content for audiences to provide their own commentary. 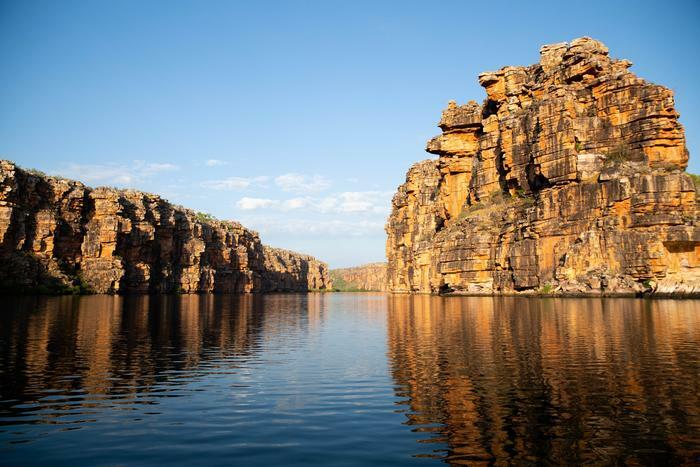 The Kimberley Cruise: Australia’s Last Great Wilderness is part of SBS’s ‘Slow Summer’ series. Perhaps the most striking finding from Deloitte’s 2018 survey is that 91 per cent of us are now multi-tasking while watching TV (up from 79 per cent in 2014): in other words, we might be “passively” consuming what we’re watching. So the real brilliance of slow TV is its ability to meet the needs of both passive and active consumption. It works on two levels: as a beautiful view in the living room, kitchen, and wherever else your flat-screens might be, and on the other hand if you give it the attention it deserves, you might find yourself embarking on an intellectually stimulating and imaginative journey. It is precisely the lack of narration and character-driven narrative that opens up the space for interpretation and opinion. While the Slow Summer programs are only available online temporarily, as with as regular programs, their unique capacity to inspire audiences means they should remain of interest for decades to come. Our politicians and media consistently chase short-term achievements. As we all rush back to work, perhaps revising our KPIs and considering the value of “slow ratings” might make our collective journey more enjoyable. Aaron Burton is a lecturer in Media Arts at the University of Wollongong. This article is republished from The Conversation under a Creative Commons licence.